Suitable for the GoPro Hero5 Black, Hero5 Session, Hero4, Hero3+, Hero3, Hero2, Hero1, Hero Session with a standard 1/4 inch screw thread fitting adaptor. Gearless extending centre column and quick release leg locks take the stand from the folded height of 530mm (21″) to 1400mm (55″). Quick release mount plate and legs allow you to remove your action camera and fold up the tripod quickly. Weighing less than 1kg (2lbs), it is compact yet strong and ideal for travel. Quick release leg locks enable the tripod to be extendable from the folded height of 53cm (21″) to 140cm (55″) (excluding camera) when the gearless extending centre pole is at its maximum. 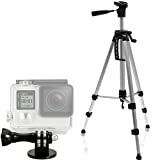 This entry was posted in Discount Photography and tagged 140cm, Adaptor, Aluminium, Black, Extendable, GoPro, Hero, Hero1, Hero2, Hero3+, Hero4, Hero5, iGadgitz, Lightweight, Mount, Screw, Session, Silver, Stand, Thumb, Tripod by Ball Photo. Bookmark the permalink.